LAKE FOREST/LAKE BLUFF — Charlie Capps, Andre Josephitis and Tyler Nicholas met as third graders in the same Cub Scout den. Fishing kept them close as they grew up. The three did a lot of things together in their youth, but fishing off Lake Bluff s Sunrise Beach had a special draw. “When we got a fish on the hook we all had to bring it in together,” said Capps. “It was less about the (strength of the) fish and more about doing it together,” added Nicholas. Nicholas took it a step further when he restored the Lillian Dells pedestrian path as his Eagle Scout project, making it easier for people to walk to the lakefront. He can see his work while fishing. 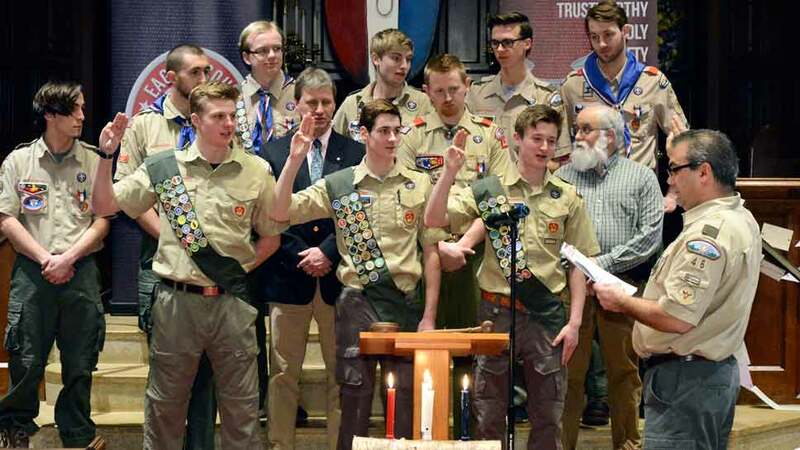 Nicholas, Josephitis and Capps became the newest members of Lake Forest Boy Scout Troop 46 to earn Eagle Scout together during a Court of Honor March 10 at the First Presbyterian Church in Lake Forest. The rank of Eagle Scout is the highest honor anyone participating in Boy Scouts can earn. While people do not remain Cub Scouts or Boy Scouts, they are always Eagle Scouts, according Richard Walther, retired scoutmaster. Walther talked about the Eagle Project as he was presenting Nicholas, Josephitis and Capps with their Eagle Scout awards. He said it was a comprehensive service project for the community where they demonstrated organizational skills involving other Scouts. 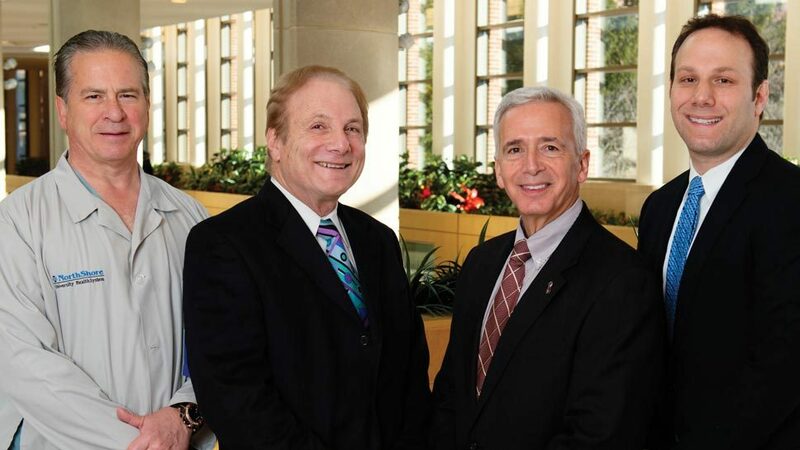 In the case of Capps, Nicholas and Josephitis, they helped out with each other’s projects as well as recruiting others in the troop to assist. While Nicholas said there was a lot of physical labor getting the path restored, he also had to find a way to pay for the materials. 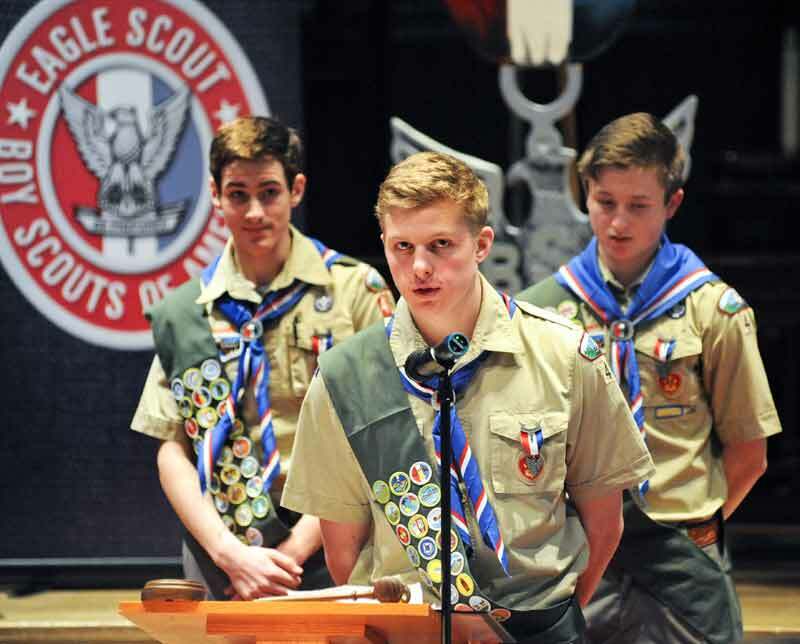 Charlie Capps address the crowd as fellow Troop 46 members and Eagle Scout candidates, behind left to right, Andre Josephitis, and Tyler Nichols listen on. Nicholas got in touch with Lake Bluff-based Peter Baker & Son, and the company donated the material. From there it was a matter of planning the work, getting the needed help from other Scouts and completing the task. Josephitis organized and oversaw construction of a boardwalk leading to a viewing platform at the Carolyn Goetz Wetlands Preserve, which is one of the Lake Bluff Open Lands Association properties. He met with officials of the association and the village to get his plans approved. He too needed funding, tools and help with the work. Capps got high tech with his Eagle Scout project. 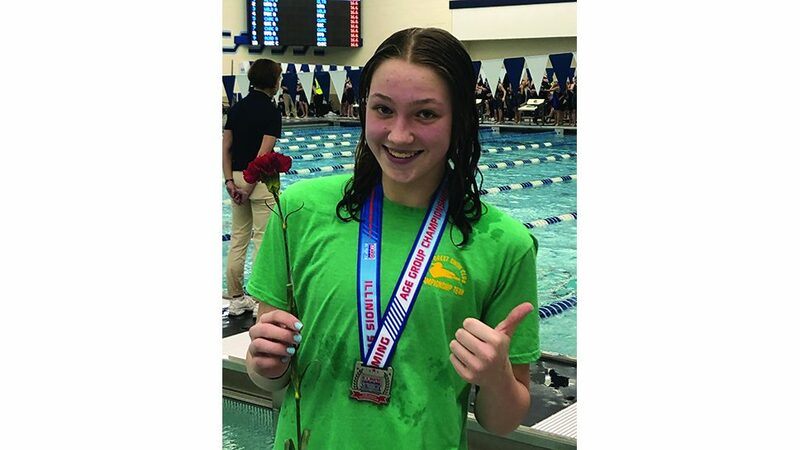 He learned from people at the Lake Bluff Park District there was a concern about losing track of the memorial plaques throughout the village’s parks. There are more than 80. Capps undertook the task of finding all of them and cataloguing each one. “I went around to all the parks in Lake Bluff finding them and mapping them,” said Capps. When Capps, Nicholas and Josephitis were in third grade, they were in both the same class and same Cub Scout den. They clicked as friends and their bond continued to grow. “We advanced through it all together,” said Capps. “In middle school we really started doing a lot of things together,” added Nicholas. Though all three Eagle Scouts got their pins, bandanas and other accolades at the same Court of Honor, Nicholas was the first to achieve the rank on June 5. Not only did he achieve six previous ranks on the way to the top starting in 2011, he held leadership positions. He was an instructor, assistant patrol leader, patrol leader and chaplain aid. Capps advanced at a similar pace completing his Eagle Scout requirements October 7. He too was a chaplain aid, patrol leader and instructor. He was also the leader of the flower sale. Josephitis finished his Eagle Scout requirements December 2. Along with also serving as a patrol leader and assistant patrol leader, he was a safety instructor and troop guide. 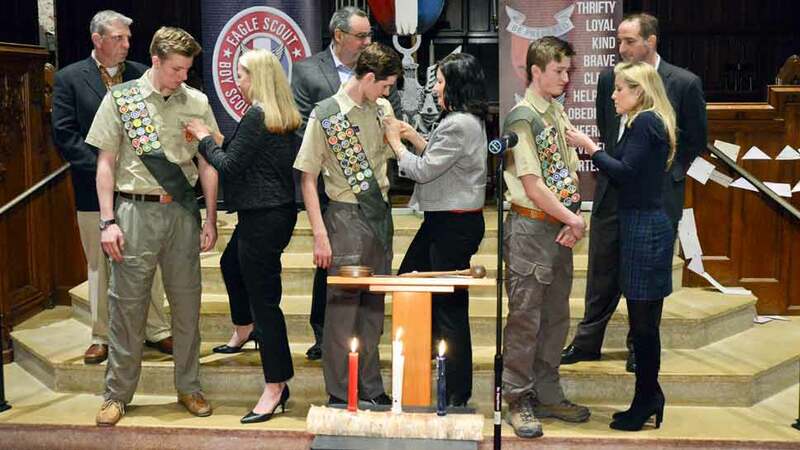 All three Eagle Scouts became part of the Order of the Arrow in 2014, according to the program. It is the national honor society of scouting, according to the website of the Boy Scouts of America.